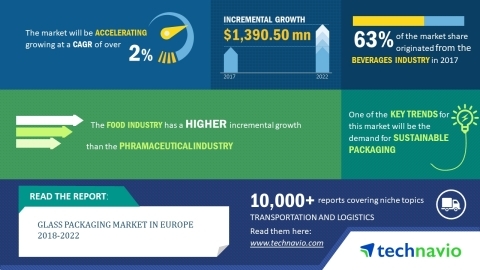 LONDON--(BUSINESS WIRE)--Technavio’s latest market research report on the glass packaging market in Europe provides an analysis of the most important trends expected to impact the market outlook from 2018-2022. According to Technavio analysts, the glass packaging market in Europe will grow at a CAGR of over 2% during the forecast period. The compatibility of glass as packaging material is a major factor driving the market’s growth. Concerns about the use of environment-friendly packaging material is another driver for the glass packaging market. Glass is nonporous and impermeable, which makes it ideal for packaging. It does not affect the flavor or the taste of the product, as it is chemically inert. It has Generally Recognized as Safe (GRAS) ratings, which is the highest in terms of rating a packaging material for safety. During the forecast period, sustainable packaging is expected to have a major impact on the purchasing decision of the customer. This can be attributed to the growing consensus among consumers that the packaging materials lead to more wastage. Nearly one-third of the consumers consider that some products are often over-packaged. Thus, the material with the least environmental footprint will have high demand. This will impact the food and beverages packaging industries as they are the fastest growing segments of glass packaging in Europe. “Glass stands at third position after paper and metal, in terms of recyclable packaging materials. Presently, nearly 70% of glass containers produced in Europe comes from recycled glass. Companies that have adopted sustainable policies in their manufacturing activities have reported a margin of up to 3%-5% higher than their traditional manufacturing counterparts. Thus, by increasing the proportion of recycled raw glass in raw material, glass container manufacturers have a scope to increase their margins. They can combine with glass recycling companies to develop efficient glass collecting practices to bring back 30% of wastes glass into the cycle,” says a senior analyst at Technavio for research on packaging. This market research report segments the glass packaging market in Europe into the following end-users (beverages industry, food industry, and pharmaceutical industry) and key regions (Germany, Italy, and Rest of Europe). The beverages industry segment held the largest market share in 2017, accounting for nearly 63% of the market. The market share for this end-user is expected to decrease nearly 3% by 2022. The fastest growing end-user is food industry, which will account for nearly 18% of the total market share by 2022. Germany was the leading region for the glass packaging market in Europe in 2017, accounting for a market share of nearly 17%. By 2022, Germany is expected to continue dominating the market. Technavio’s latest market research report on the glass packaging market in Europe provides an analysis of the most important trends and drivers.